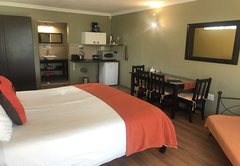 Haus Holzapfel is a highly recommended B&B with self catering option, providing accommodation in Beaufort West for tourists visiting the Karoo region. 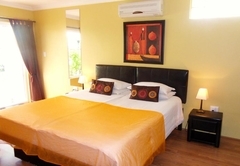 This warm and inviting home, with a wonderful ambience, is beautifully decorated and furnished. 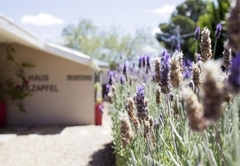 Haus Holzapfel offers two sunny and bright suites which accommodate two to four people. 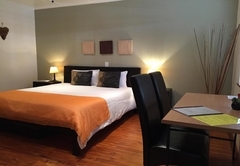 The suites have a private entrance, a gorgeous bedroom with German beds and a sitting area. 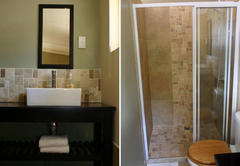 The modern styled en suite bathrooms have a toilet, basin and shower with natural slate tiles. 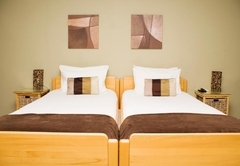 The newly opened en suite double room has a double bed with extra length and accommodates max two adults. 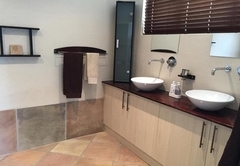 For families up to six persons we offer our newly built “Karopa” Self Catering House with three luxury bedrooms and two beautiful bathrooms, kitchen with granite tops, dining room with leather couch, fully air conditioned , big Plasma DSTV, Wifi, braai, secure parking, which is just 1.5km away from the main guesthouse. 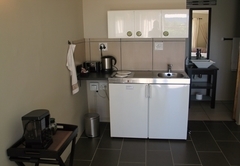 The suites have their own fully equipped kitchenettes with crockery, cutlery, glassware, fridge, microwave, kettle and toaster. There is a patio which leads out onto the beautiful garden and to the saltwater swimming pool. 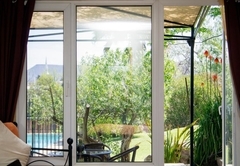 Enjoy breakfast or magnificent sundowners in the privacy of your own secluded garden and patio whilst listening to the birdsong and revel in the peace and tranquility that Haus Holzapfel offers. From there you can also see the Swartberge on the horizon. On request your kitchenette will be fully stocked with breakfast cereals, yoghurt, tea, filter coffee, milk, sugar, juice, bread, butter, jams, cheese and sliced meat. 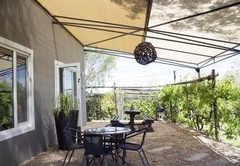 Enjoy a self serve Continental Breakfast on your own patio overlooking the Swartberge. 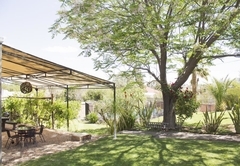 • Haus Holzapfel is situated close to the famous Karoo National Park. • Hunting farms with their spectacular game are also close by. • We offer shaded off street parking. • Phone, fax and wireless internet facilities are available. • We regret no smoking and no pets. • Individual guided tours are available on request. • We speak Afrikaans, English and German. 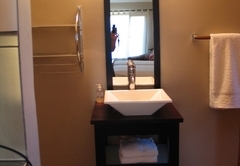 Luxury modern suite with a King Size Bed and en-suite bathroom, with a shower, basin and toilet. 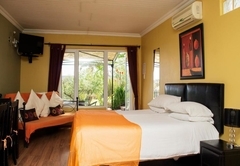 Double bed sleeper couch included in the room, as well as DStv, air-conditioning and free Wi-Fi Internet. 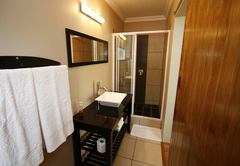 Luxury suite with a modern en-suite bathroom , with a shower, basin and toilet. 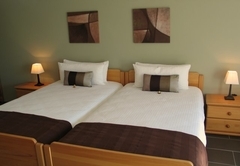 There are two single beds extra lenght with a pull out queen size bed extra lenght.. 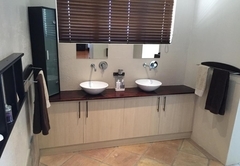 Double room with granite top and private en-suite bathroom. 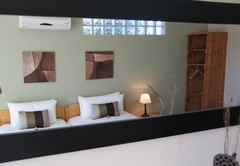 LCD flat screen TV with DSTV, WIFI Internet, air-conditioning and underfloor heating. 4 single beds, Open plan kitchen. 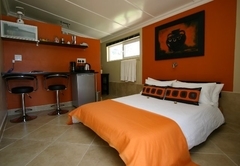 42" LCD TV with DSTV, free WiFi, Aircon, Secure Parking and Bathroom with shower. 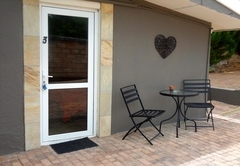 Optional inter-leading door to the two bedroom apartment. Please book in conjunction with unit 5f if needed. 4 single beds, Open plan kitchen. 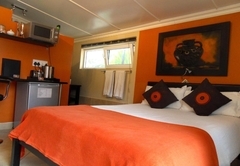 42" LCD TV with DSTV, free WiFi, Aircon, Secure Parking and Bathroom with shower. Optional interleading door to the two bedroom apartment. Please book in conjunction with unit 5e if needed. Upon our arrival I was immediately impressed with Haus Holzapfel - the guesthouse looked beautiful and well-maintained. I thought to myself: "If the outside looks like this, imagine the inside! We were greeted by the host and instantly I knew that this was going to be a wonderful experience! 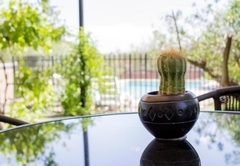 I felt safe and secure and knew that I could rely on my host should there be any problems - which there weren't due to the wonderful organisation! When we were shown our room I was amazed! If it were not for the activities for the rest of the weekend I would have loved to stay another evening! It was marvellous, the room was well-equipped with everything we needed! I can only say that I will never have to look for a guesthouse again when the need arises to sleep in Beaufort West! I have most certainly found the heart of the Karoo and the name is Haus Holzapfel! What a remarkable place with magnificent hosts! The greatest compliment you can pay a B&B once you found it on the internet is to report that it is even better than it looked like on the photo's. 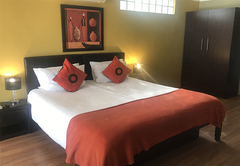 The photo's on the site does not do justes to the pleasant welcoming atmosphere of the rooms and the staff. A gret place to stay. Response timeHaus Holzapfel typically responds to requests in 5-10 minutes.